One of the hottest pieces of hardware gear covered at CDM (at least according to our hit counts on CDM’s original report) is now shipping. 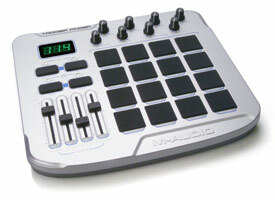 M-Audio’s Trigger Finger, a USB/MIDI control surface with 16 pressure-sensitive drum pads, 4 faders, and 8 knobs, is in stock at major outlets. I’ve tried it, and it feels great. Add in templates for Reason and Live (among others), and I’m completely sold. This thing looks like too much fun. Music123.com has it for US$199 ; so does Musician’s Friend.